Most days at school there's a fruit served with lunch. I like apple days best, and am always a little bit disappointed on grape days. Okay so today I get to the lunchroom and see what looks like a tomato on each students' tray. Now, tomato soup and tomato sauce? Love it. Tomato slices on a sub? I'll eat the it, but would never specifically request that tomatoes be added. A whole tomato? Nope, have not done it and would rather not. And then I sit down at the teacher table and realize I'm not exactly sure anymore if they even are tomatoes. I wait for someone else to eat theirs because I have no idea how to. It took a while before I saw one being eaten. Finally a teacher down a few spots ate both of hers. She had cut the fruit in half (with her spoon, I'm assuming -- I missed that part), and was eating out of it with her spoon, like a kiwi. She ate everything but the skin. When the teacher directly across from me started to eat hers, I observed more closely and then tried it myself. The inside is not what I expected. It reminded me of pumpkin insides with the stringy texture, and it felt juicy and sloppy to eat. Sloppy in the sense that it didn't stay together like orange slices or bananas or apples - or even kiwi. So you didn't have to chew that much, the fruit felt mashed already when it reached my mouth. Mystery fruit at lunch today. I ate one at school and took this one home. On the walk back to the classroom with my co-teacher, before I could even ask her about the fruit she started to ask me what I thought of it. So then I asked her what it was. She was surprised that I didn't know what it was called, and that I'd never eaten one before. Turns out the fruit is called persimmon in English. That's a link to its wiki so you can read up. Persimmons are native to China, and were later introduced to southern Europe and California in the 1800s. I didn't have the most varied diet growing up, so I'm not sure if this is a fruit most Americans from the midwest have heard of before or not. 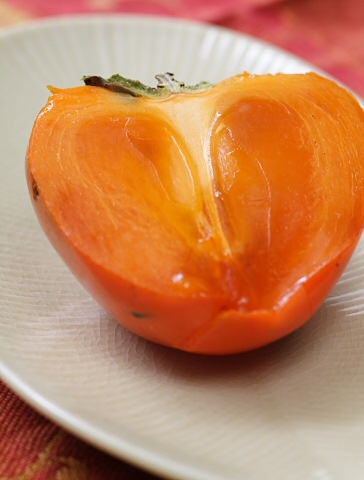 Have you ever eaten a persimmon? Have you heard of it? Interesting -- thanks for the comment, Kaley! Now I'm going to have to ask some Spanish friends if they've eaten caqui. I'm curious about how common it is in Spain.